Travast sterile eye drops: Each ml contains 40 microgram of Travoprost USP. Travoprost is a clear, colorless to slightly yellow oil. 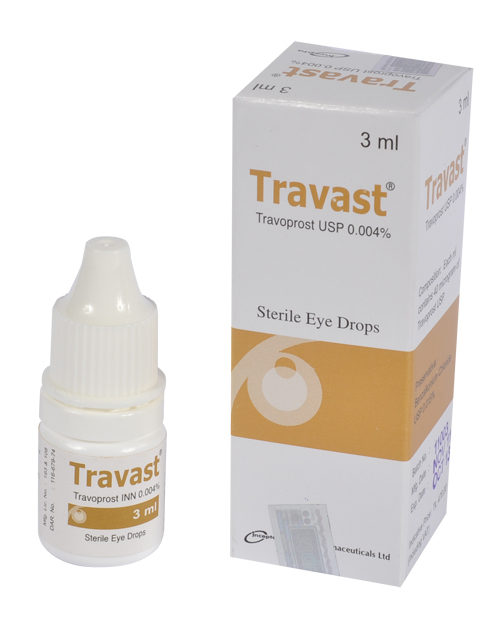 Travast ophthalmic solution is supplied as sterile, buffered aqueous solution of travoprost. Decrease of elevated intraocular pressure in patients with ocular hypertension or open-angle glaucoma. One drop in the affected eye once-daily in the evening. The dosage of Travast should not exceed once daily since it has been shown that more frequent administration may decrease the normal intraocular pressure. The efficacy and safety of travoprost eye drops in patients below the age of 18 years have not been established. The most common ocular adverse effect is ocular hyperemia. Ocular adverse events reported at an incidence of 5-10% included decreased visual acuity, eye discomfort, foreign body sensation, pain, and pruritus. Ocular adverse events reported at an incidence of 1-4% included, abnormal vision, blepharitis, blurred vision, cataract, conjunctivitis, dry eye, flare, iris discoloration, keratitis, lid margin crusting, photophobia, subconjunctival hemorrhage, and tearing. Travast eye drops should be used with caution in patients with active intraocular inflammation & macular edema. In case of patients with mild to severe hepatic impairment and renal impairment (creatinine clearance as low as 14 ml/min) no dosage adjustment is necessary. Travast should not be administered while wearing contact lenses. Lenses may be reinserted 15 minutes following administration of Travast eye drop. Pregnancy category C. It is unknown whether travoprost from eye drops is excreted in human breast milk. Animal studies have shown excretion of travoprost and metabolites in breast milk. The use of Travast by breast-feeding mothers is not recommended.